When it comes to the most economically efficient way to reduce Greenhouse Gas Emissions(GHG), the economic consensus is that a carbon tax, or, failing that, a carbon trading scheme is the best way to go. The idea is that a price for carbon will raise the cost of carbon-producing activities, nudging people and companies towards less harmful behavior. I have a problem with this line of reasoning, since it rests on the false assumption that price signals are the most effective way to change behavior. That’s true is an economist’s ideal efficient market, but a moment’s reflection shows that the markets we want to affect are far from efficient. Electric utilities are regulated entities, and hence insulated from market forces. Consumers don’t respond well to price signals either, because most don’t understand where they are wasting energy. If they did, there would be a run on caulk to air seal homes, since the payback from air-sealing can be a matter of weeks. If a 1000% annual return from air sealing is not enough to get people to spend a little time with a caulk gun, is increasing the return to 1200% with a carbon tax really going to make a difference? Compact fluorescent bulbs are another excellent example of how the energy market often fails to be efficient. The payback on CFLs is usually on the order of months, but uptake was very slow until recently, now that higher wattage incandescent bulbs are being phased out. By regulation. The adoption of CFLs is a concrete example where the most economically efficient outcome is being achieved by regulation, after years of failure by market forces. I had just finished making the above case to an economist at a mixer at The Cary Institute in Millbrook, NY when I was asked to write for a public radio program sponsored by the Institute. I had been talking to the Institute’s volunteer coordinator about opportunities that make use of my skills, and she hit on helping them write some segments for Earth Wise, a daily 2 minute radio program on WAMC. So I went home and wrote up my ideas, outlined above, on carbon pricing. The first draft did not work for them, since they had aired a program in favor of a carbon tax, so I re-wrote it with a focus on making carbon pricing more effective by making the energy market more efficient. The result aired on July 3rd, and you can listen to it or read it here: http://wamcradio.org/EarthWise/?p=2668. With only two minutes, it’s an interesting exercise of packing my ideas into just 280 words, especially considering that for me, 600 words is what I consider a short peice, and it’s not unusual for me to write several thousand. For future episodes, I plan to tackle less complex subjects. I’m getting tired of the knee-jerk reactions to all the pink slime controversy from the environmental establishment. Like this one, which spured this article. I totally agree that pink slime is gross, but so is digging through your trash for recyclables, toilet-to-tap water recycling. But both are very green. Likewise, industrial processes like CAFOs and pink slime are not all bad- the good and the bad have to be carefully weighed… we should not dismiss one side just because it is gross. And “pink slime” is a way to use parts of the cow which would otherwise be thrown away. If we use 15% pink slime as a filler in our hamburger, we reduce the environmental impact of that hamburger by approximately 15% (as something which would otherwise be waste, pink slime has no negative environmental impact, except for that caused by processing it, and has some positive impact because it’s not rotting and producing methane in a landfill somewhere. Pink slime is an environmental innovation. It only started being gross when we started talking about it. So do the planet a favor, and stop worrying about what’s in your burger. Unless you’re ready to give up the burger altogether. I felt the “Editor’s Corner” article in the most recent Financial Analysts Journal (Sept/Oct 2011) “Pricing Climate Change Risk Appropriately” does an excellent job explaining why the possibility of extreme climate scenarios justifies a considerably higher price for carbon than would be warranted under the most likely or average scenario: Humans are risk averse. Equities… have low prices (and high expected returns) because their cash flows are discounted by society at high rates. The reason has to do with the anti-insurance aspect of equities: Their cash flows are highest in good states of nature whereby the value placed on the cash flows is low. In contrast, efforts to mitigate climate change by pricing carbon emissions will be most valuable to society if climate change turns out to have catastrophic consequences for society’s well-being. Because of this insurance aspect, society should be willing to pay higher prices for climate change mitigation. FAJ Executive Editor Robert Litterman goes on to explain the mechanics behind carbon pricing models and their flaws, as well as why equity analysts are uniquely qualified to do these assessments. I’ve long thought that financial market theory is uniquely applicable to understanding climate and the measures needed to mitigate climate change. what I don’t understand is why I hear so few analysts talking about it, so it was very refreshing to come across this article applying a deep understanding of economic pricing theory to what the greatest challenge the world will confront in the 21st century. My study of chaos theory led to my conviction that knowing the limits of our ability to predict is much more important than the predictions themselves, a lesson I apply to both climate science and the financial markets. Despite having written about financial markets and clean energy stocks regularly since 2006, I have never before explained in print what I meant by that. This summer’s heat wave and stock market turbulence illustrate how my intuition about chaos theory informs both my understanding of the climate and the stock market. The definition of a chaotic system I use is any system in which a tiny change in initial conditions can lead to a large change in results. Most chaotic systems are chaotic because they contain positive feedback. Positive feedback tends to amplify trends over time, while negative feedback tends to reduce trends over time. Complex systems such as climate and the financial markets have both positive and negative feedback. In stock markets, financial bubbles grow with the help of several types of positive feedback. One such is “The specious association of money with intelligence,” as John Kenneth Galbraith described it in his short and very readable book on bubbles, A Short History of Financial Euphoria: Financial Genius is Before the Fall. When we see others make money in a stock market rise, we tend to think they must have been smart to have known when to get in. If we made money recently by buying stocks, we tend to think we are smart for having done so. In both cases, we’re more likely to think that buying stocks is a smart thing to do, even if the profits were just dumb luck. Collectively, this leads to more buying, which further raises prices. Even if those price rises are justified in the beginning, the positive feedback can carry them up far beyond any level justifiable by the value of the underlying companies. Many other positive feedbacks such as the wealth effect, relative valuation methods, and the increased ability to borrow against inflated asset prices operate in financial bubbles and bull markets. In contrast, fundamental and value investors produce negative feedbacks by buying when prices have fallen and selling when prices have risen. As with weather, external shocks to the system can reverse even these self-reinforcing trends, as we recently saw when the US’s political paralysis around the debt ceiling debate and Europe’s inability to effectively deal with their debt crisis recently ended the two year bull market in July. also regular and predictable, but seems to follow a different set of rules. 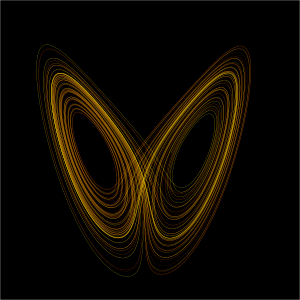 Such behavior can be mapped with simple chaotic systems and often exhibits a pattern called a Strange Attractor, two of which are pictured with this article. As the system moves through such a strange attractor, it will often stay in one set of the rings curves shown for an extended period, before jumping to another set after an unpredictable period. In the weather, we see this sort of behavior with extended heat waves, cold spells, or periods when it is hot in the morning followed by an afternoon thunderstorm. Such patterns persist for days or weeks, but then quickly end to be replaced by a new pattern or a period of less predictable weather. inaccessible book, The Alchemy of Finance, George Soros describes how he tries to spot such tipping points or regime changes as they happen. Much theoretical work has been done to understand and model such changes, but the lesson I draw from chaos theory is that recognizing such changes in hindsight may be simple, but predicting them in advance is and will continue to be extremely difficult. That’s probably why Soros did a much better job describing market regimes than explaining how to spot them. Black Swan . His Black Swans are events which cannot be predicted solely by studying the past. Such events occur, he says, because the rules we infer from the observation of events never contain the full range of possibilities. He applies this lesson to societal events, personal experiences, and financial markets– all of which are chaotic systems. There are also climatic Black Swans. no guarantee of future climactic results. “Global Warming” can sound somewhat comforting. “Climate Change” can sound clinical and distant. A better description is “Global Weirding:” the climate is not becoming a warmer version of what we’re used to, it’s becoming an entirely new system, with a new set of patterns that will surprise anyone expecting a version of the old climate regime. There is only one climate, while there are hundreds if not thousands of financial markets operating at any one time. Financial markets also operate on a much more compressed time scale, with bubbles and busts compressed into a few short years or decades. Ice Ages, on the other hand, last tens of millions of years. over the course of human history. Although the rules of markets change with new technology and communication, the basic rules of human psychology which govern these regimes have not. To paraphrase Mark Twain, financial history may not repeat itself, but it does rhyme. Climactic history may also rhyme, but we’ve not yet read a full line of the poem: We don’t know what it will rhyme with. Ice ages and warm periods often last tens of millions of years. Given the infrequency of shifts between one climactic regime and another, it’s quite likely that the new climactic regime we are heading into will be unlike anything that has prevailed during human history, and possibly unlike anything in the geologic record. The benefit of the slow pace of climactic history is that we do have a few years or decades during which we will be able to influence the path of global weirding. In a chaotic system, a tiny change today can lead to a large change in future outcomes. What tiny change are you making? Shale Gas: Not Clean, Either? Not only are there serious questions about just how abundant natural gas from shale plays is, it now turns out that this “Cheap, Clean, Abundant, and Domestic” resource may turn out to only be domestic. 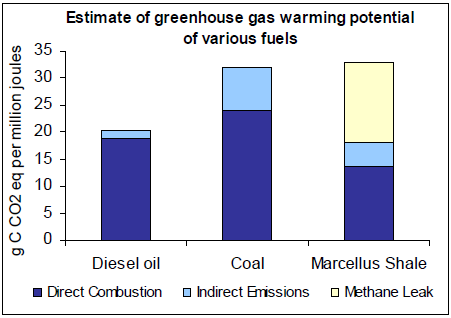 In a draft paper, Cornell researcher Robert Howarth calculates that, when methane leakage from hydraulic fracturing is included, along with secondary contributions from forest clearance and water transport are included, the carbon footprint of shale gas is slightly worse than coal’s. RealClimate has an article outing "The 2008 International Conference on Climate Change" as a publicity event to generate reports in the press of a lack of consensus in the scientific community about anthropogenic Climate Change. a honorarium of $10,000 for articles by scientists disputing anthropogenic climate change. So this appear to be the current market prices for calling global warming into question: $1000 for a lecture and $10,000 for a written paper. Unfortunately, accurate data on the Climate Denial Reserves and Prices are scarce, but these prices make me think we’re well past peak (or at least on an undulating plateau.) Fortunately, society will continue to function (and most likely run better) when Denial Depletion reduces Denial Reserves to a few crazy bloggers in dark corners of the Internet.